This week is Good Money Week so take a look at what's going on and get involved. My "actions" towards becoming a more ethical investor/consumer include cancelling my subscription to Money Observer and using my financial magazine "allowance" to subscribe to Ethical Consumer instead. I've also written to my MP asking him to actively support the movement towards transparency and accountability in all areas of finance that is being promoted during the week. Having control over what is being done with our money makes a big difference to how we feel about the whole process and, for me, being able to be confident that my investments are being used ethically would give me an added "bonus" that is worth far more than an extra % point on the potential profit. However it turns out that taking a hit on profits is no longer necessary because, (as was reported this week) ethical funds are now heading to the top of the leader boards due to the collapse in the prices of oil and other mining stock. In recognition of the unease many of us feel about the opaque nature of investing, Abundance, who I've been investing (and earning over 7% interest) with since March, have just announced the first peer-to-peer SIPP. There's a good write up on this on crowdfundinsider.com so I won't go into details here but it's very competitively priced (free to set up and no fee for the first year, 0.3% thereafter) and seems to make excellent sense if you're ethically inclined and worried about putting all your retirement eggs in the volatile equity basket. I'm not in the market for any additional retirement investing myself as I'll soon be drawing down what I've got, but I'll certainly be talking about the Abundance product with my sons and their friends. My youngest son in particular is extremely "pension poor" as he's been in full time higher education for the last 8 years. This is exactly the kind of product that will appeal to him and his circle of friends who take the issues of corporate financial integrity and responsibility for the planet very seriously, seeing, as they can, where "turning a blind eye" has got us so far. The introduction of new financial products such as this, ones that allow us to make our money work in ways we want it to, is an exercise in crowd-sourcing in its own right. People really do want to know what is being done with their money, and they want to be able to make informed choices about whose hands they put it in. Abundance have done their research and seem to have got a lot of things right regarding this product. They are honest about the fact that this pension is not for everyone and the risks involved. At the very least they are to be applauded for pushing the market forward and providing a product that supports all the principles of "Good Money" this and every week. Really love the idea of the Abundance stuff, especially the new SIPP! Kudos for writing to your MP. I've always worked in public sector jobs where the salary scales attached to each role are published as part of HR policy. Everyone knows what everyone earns and, apart from a period of time when I worked in an Unemployment Benefit Office just as performance related pay was being introduced, everyone doing the same job as me is earning the same pay. I think pay transparency is a good idea as it is far less divisive than "confidentiality" and by making the "job being done" the driver of how much salary is paid rather than the person doing it, there is far less scope for workplace favouritism, gossip-mongering, overall bad feeling, secrecy and distrust (which is all a waste of time and energy for everyone concerned). Has to be better in my opinion. But then I've never known anything else. I'm not anti P2P (I joined Zopa 10 years ago when it started) or against financial innovation, but I'm not sure about a P2P pension. It's an untested asset class (hasn't been though a full credit cycle), the returns are moderate - particularly for a long-term investment like a pension - the credit risk is often under-stated. It's not really suitable for more than 5% to 10% of your net worth. I agree with Mike, although I am very much in favour of this new type of pension becoming available. I already have a main SIPP, so if I went in for something like this, it'd just be a small portion of my overall retirement pot. The risks with P2P are far higher than with stocks, and VERY illiquid compared to stocks. However, I like to have the option for diversifying my income streams as much as possible, so I'm up for it, in a sensible manner! Also Share Radio (which I posted about recently) has a recent podcast where they interview Abundance about their new SIPP! I shall check that out later this week. Not sure yet whether I will be topping up my existing small investment in Abundance. I may go down the route M has suggested of going for investment trusts that don't have oil or tobacco in their top 10 lists, to maybe balance out the ones I invest in that do...I wasn't planning on investing in any more funds as I'm trying to avoid the higher fees but I'll see what's about. "workplace favouritism, gossip-mongering, overall bad feeling, secrecy and distrust (which is all a waste of time and energy for everyone concerned)." Sounds bad I know, yet I feel the alternative would cause an uproar! This is how I've always worked, where no one knows what anyone else is earning and I'm not sure that I want to know as I think if I did know, I would feel resentment if that person wasn't doing a proper job, not pulling their weight or taking responsibility. I feel that it's unlikely that we would get total transparency as the company would no doubt have to start paying some people more to be in line with their peers, in particular, I suspect, women doing the same jobs as men. Right now, I feel that I am happier being ignorant - I'm only bothered about what I earn. Thanks Mike for the note of caution. I quite agree, aiming to fund all your pension via P2P would not be advisable. As M says, diversification is very important and the Abundance SIPP does offer the opportunity for adding another type of investment into a healthy mix. Hi weenie, many thanks for the links (and M too). I'll make sure to check them out. Very interesting M. Apparently ethical banking practises, trust and responsibility are overtaking clean energy as the key issues people have concerns about when asked about ethics in finance. It's also possible to invest in community energy projects directly though obviously all the risks you would expect apply. I am a (voluntary) director of (and investor in) South East London Community Energy. We're currently crowdfunding to put solar panels on 4 local schools. The aim is to give investors a return of 4% but for those eligible this should be greatly enhanced by the EIS scheme. This allows people to reclaim 30% of their investment against income tax paid in the same year. Not everyone is eligible and as always do your own research but for me it's a great investment considering the environmental and community benefits. HI Andrew, thanks for this. The existence of initiatives like this show that there is a real drive in communities to make sustainable energy work which is good news for us all. The very best of luck with it. I hadn't heard of the EIS before but it does look very interesting. I have just perused every entry on your blog. I came here via the Ermine from simple in suffolk. The note about buying supplements really hit home with me. I have a cupboard full of them and not infrequently buy more leaving one miracle cure half-finished for another. I am planning an early retirement (before 40) and want to demystify "investing" for myself. Can you provide a list of books you read when first getting started? Thanks M for that really useful link. As you came to my blog via ermine's I'm pretty sure you must also have come across my other biggest source of information - Monevator, and FiRe blogs in general. Good money week, great idea! I had heard about it elsewhere but your post prompted me to read about it in more detail and has some great links to get us all started. 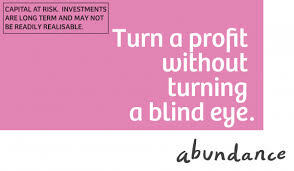 The Abundance SIPP is something I'll definitely be checking out when I have some more funds to spare.